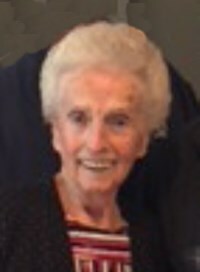 Mary L. (Johnson) Howarth, 86, of Lowell, passed away peacefully Saturday morning May 12, 2018 at Wingate at Belvidere surrounded by her loving family. She was the beloved wife of the late Lawrence W. Howarth, Sr..
Born in Lowell, Massachusetts, May 6, 1932, a daughter of the late George and the late Ellen (Foye) Johnson, she attended Lowell schools and was a graduate of Lowell High School Class of 1950. Prior to her retirement, Mary was a medical secretary at the former St. John’s Hospital (NKA Lowell General Hospital/Saints Campus) for many years. Among her many interests, Mary enjoyed summers at Wyman’s Beach, winters in Florida and trips to Las Vegas but the time she cherished most was when she was with her family. Mary is survived by three sons Larry W. Howarth, Jr. and Joanne Doherty of Lowell, Brian E. Howarth and his wife Barbara of Weare, NH and John J. Howarth and his wife Cara Conley Howarth; three grandchildren Jason Howarth and his wife Megan, Ryan “Tiger” Howarth and his wife Kathleen, and Sarah Eliopoulos and her husband Phil all of Chelmsford; six great grandchildren Jayson, Kaydence, Jayda, Nathan and Lexi Howarth and Scarlett Eliopoulos. She was also the mother of the late Gary Howarth and sister of the late George Johnson. Friends may call at the O’DONNELL FUNERAL HOME 276 PAWTUCKET ST. at Fletcher from 4 to 7 P.M. Wednesday. Relatives and friends are invited to her Funeral Mass to be celebrated Thursday morning at ST. MARGARET CHURCH at 10 o’clock followed by her burial at St. Patrick Cemetery. E-condolences at www.odonnellfuneralhome.com. Those wishing may make contributions in her memory to the Mt. Pleasant Scholarship Fund, 141 Staples St., Lowell, MA 01851. Arrangements by Funeral Director James F. O’Donnell, Jr.
Im terribly sadden by this. Mary was my neighbor for a few years, one of the sweetest women I ever had the pleasure of knowing! My daughters absolutely adored her! You will be missed sorely and I will never forget you!! Rest in peace my beautiful angel!! My deepest sympathies to her family! My condolences to the entire family. I am sure she will be missed by all. I spoke to her about 2years ago and she broke got back so many great memories as she so dearly loved her brother my dad. Rest In Peace Aunt Lou May your memory always be a blessing.